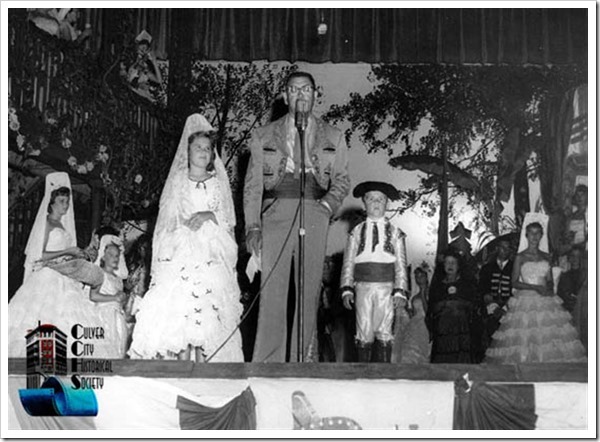 Fiesta La Ballona Days began in 1951 as a weeklong celebration of local heritage. There was something happening daily during this festive week. Everyone was expected to “dress” on Friday. If they didn’t, they might end up taking a ride in “The Pokey.” Culver Center, then a new shopping center, drew crowds to their “Thieves Market,” which was essentially a sidewalk sale. Culver Center Street was shut down for that day, with some sale proceeds earmarked for charity. There were also window dressing contests, and posters were in many retail windows. Times were simpler. The city was smaller. It began before Fox Hills was even a part of the city. Culver Crest was just in the planning stages, and Blair Hills, too. The Fiesta was not confined to a park. It was all over the city, and for everybody. 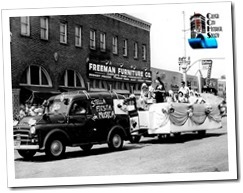 In those days police and firefighters lived in town, and many participated as volunteers to direct traffic and close down streets for the special events. It had historic significance for my dad, who was born on the Lugo Ranch in 1908, (now the area of the Roll ‘n Rye, where he loved to eat because he felt at home.). He was a fifth generation Californian, who took us proudly to the Natural History Museum every year to see the portraits of our ancestors. 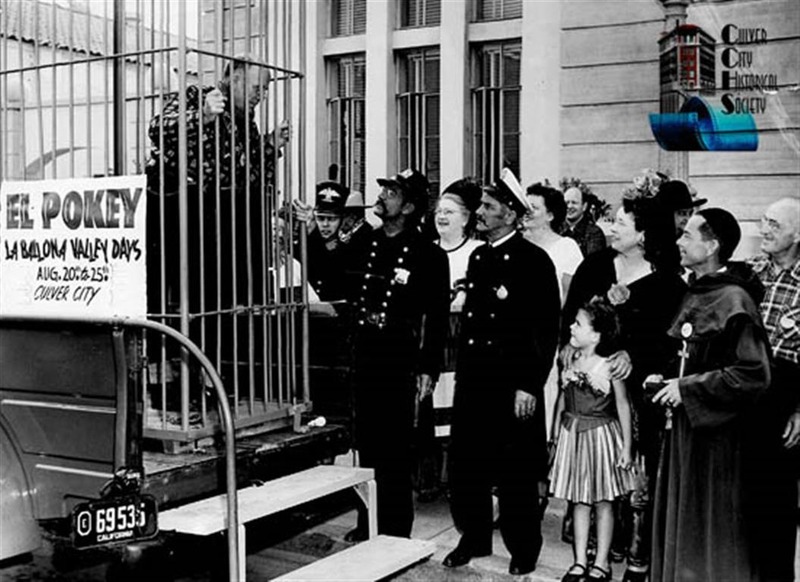 Daddy eventually retired as Captain of the CCPD in the mid-sixties, but during those early Fiestas, he worked at his police duties, often in a Cesar Romero costume on loan from MGM. 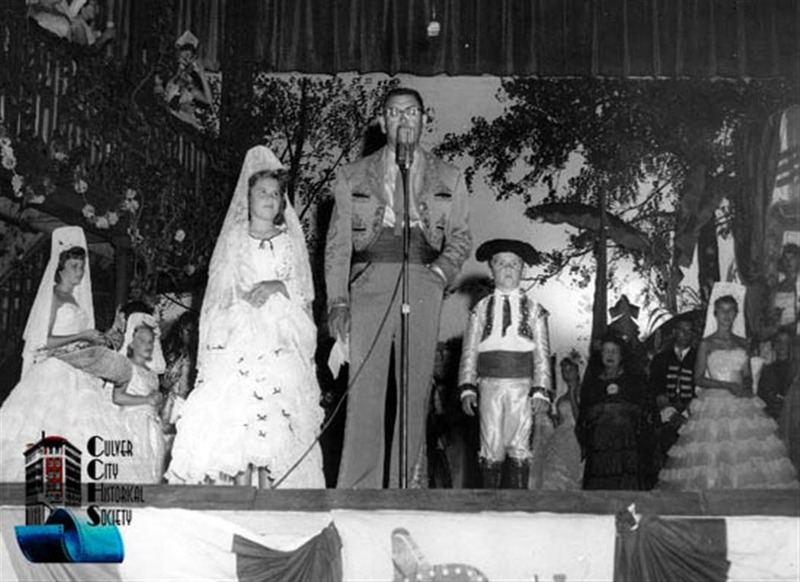 The day of the “big parade,” we all lined up on Higuera Street as I recall, and the parade honored the “early families” with names like Machado, Talamantes, Ybarra, Rocha, Saenz, Higuera (that’s pronounced “eee guera”) and Lugo. The descendents proudly took pains with their costumes. 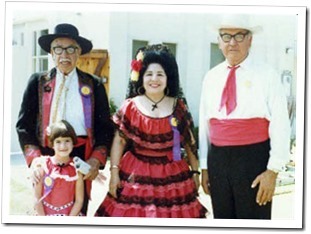 Clarita Marquez Young, an Ybarra and Saenz descendent, had thirteen special dresses with matching mantillas. My aunt sewed her own dress with layers of bright red ruffles. She wore my grandmother’s Spanish comb in her hair, topped with fine lace. She carried a fan, and relished the festive atmosphere. 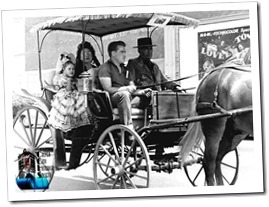 My mother made my costume for this ceremonial ride in a horse and buggy with Auntie Vicenta and Uncle George and in later years, my little brother Carlos and cousins Doreen and Mike. This was the beginning of awareness of our Latin heritage for me. Even though Mother was a blue-eyed blond born in Marietta, Georgia, she fostered pride in our Early Settler California heritage as well as her ancestry, which could have pointed to membership in the DAR for me. Some years the descendants were featured in vintage cars, which was great fun, too. There was always a placard on the vehicle identifying the family name. People lined the streets and waved as we went by. I never really mastered “the wave.” I was frankly a little embarrassed. Equestrian units shimmering with silver accents included notables like Sheriff Biscaluz and his “posse.” The float entries were made by the local service clubs or businesses. Marching bands and scout troops moved down the street to the delight of the locals, as their families and friends watched for familiar faces. 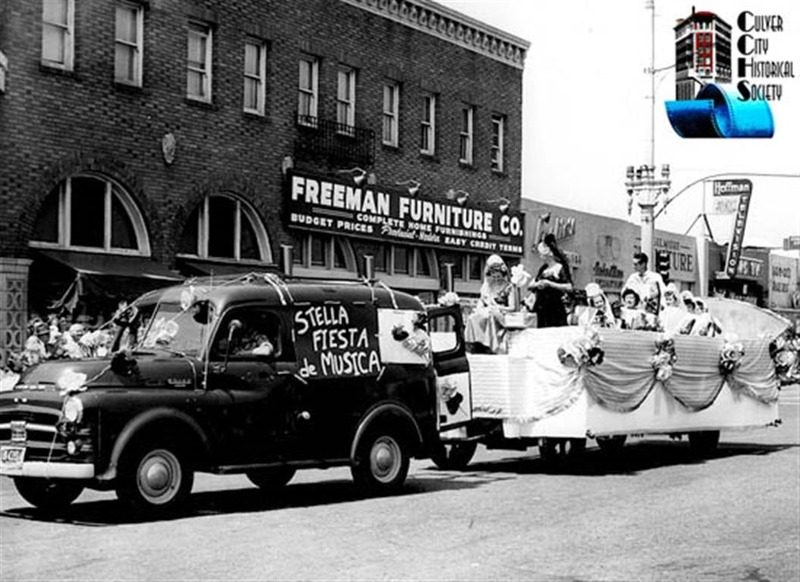 One of the floats carried the Fiesta Queen and her court. 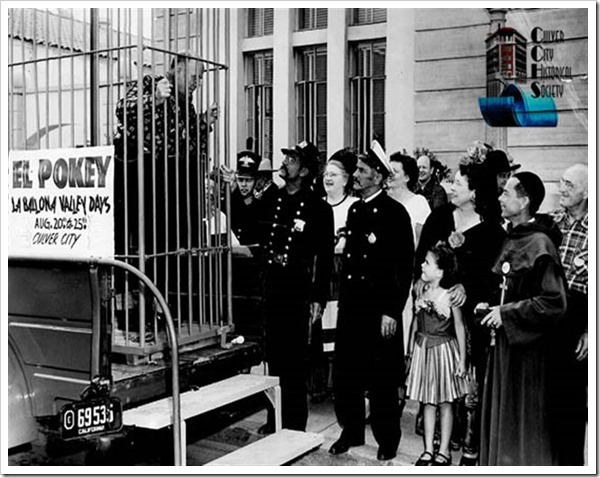 The Rotary Club rode donkeys one year, rather than sponsor a float. Everyone had fun. That was the key. There was also a “Kiddie Parade.” It took place at the Veterans’ Memorial Park, under the direction of the Parks and Recreation Department. 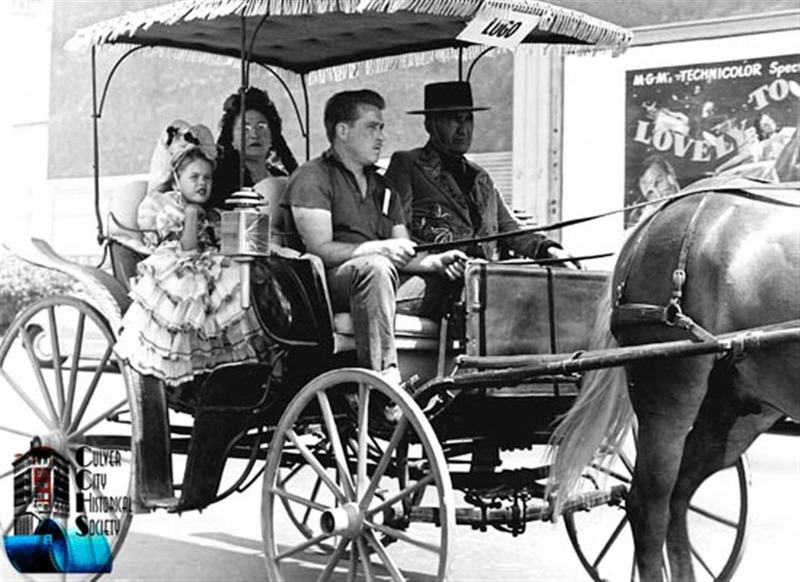 The children were all costumed in heritage garb, and we rode in—or pulled floats crafted by our parents. I think it was a little competitive fun for the parents, who proudly lined the walkway, taking photo after photo, as we moved by. One year our float was “Mamacita’s Tamale Wagon.” Then there was the Fiesta I got to pull my little red-headed cousin Charlotte, who was dressed as a little señorita in billowing lace. The base was our red wagon and that year I had to carry the family mandolin, which I could not play and dress like a boy, which did not delight me even a little bit- particularly the fake mustache that itched! The Kiddie Parade winner received a prize ice cream cake to share with family and friends. The real beauty of those times was that it was inclusive, a little like St. Patrick’s Day, when anyone who wants to can be Irish. 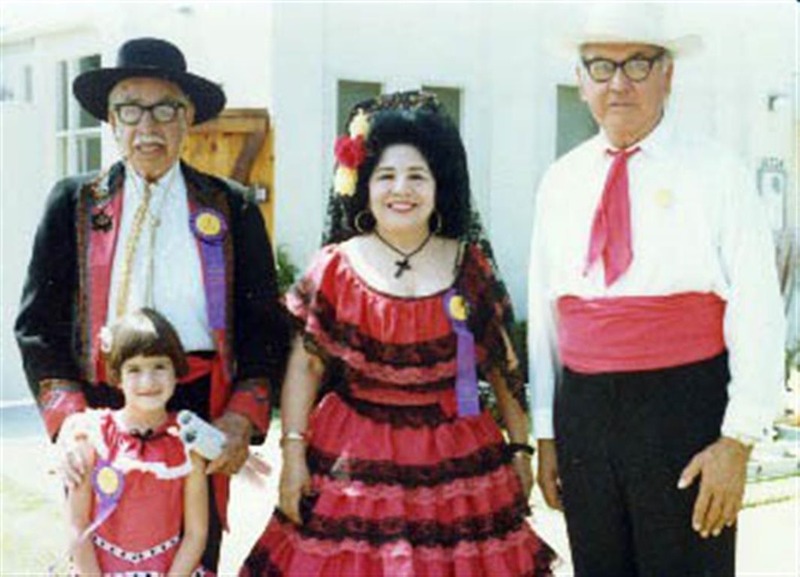 During the Fiesta, all it took was a pair of jeans to dress “western” or a little creativity to dress as Indians (politically correct at the time) or in Mexican or Spanish costumes. Olvera Street probably did a good business in August during those early years. People could do as little or as much as they wanted in the way of costumes. I remember Firley Cleveland, the manager of the water company, dressed as a monk one year, and wore a hat and zerape another. So, what is a Fiesta? Translations of the word could be “party,” “reunion” or “holiday.” The Latins don’t have a corner on partying, but they do have a history of enjoying celebrations. If I learned anything at all from the early Fiestas, it was probably commitment to community and the joy of sharing time and traditions with others.